Well, that went far better than expected. 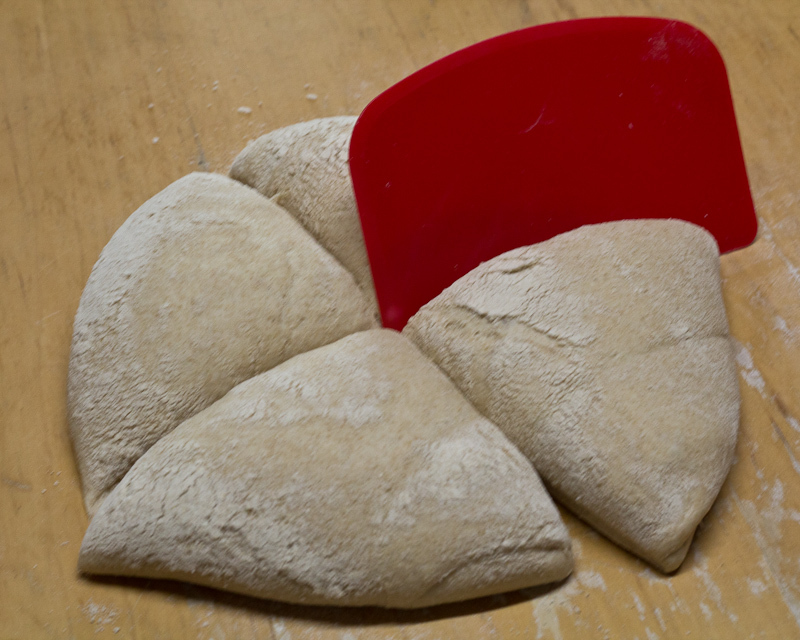 I followed Richard’s shaping method and have to confess that making long thin bits of dough was never easier. It is something I have struggled with all my life – I was fond of making plaited breads in my youth but my “sausages” were always poor. 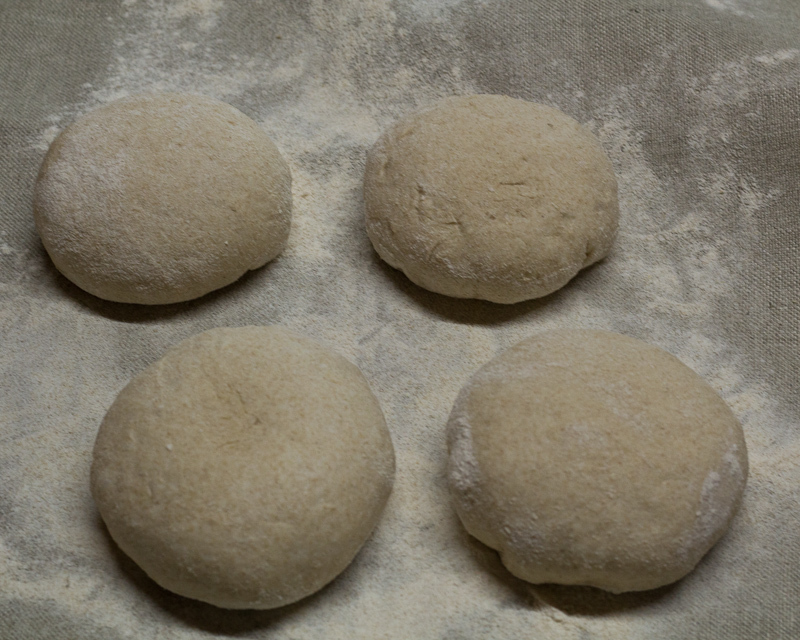 Now… is it the method or is it the dough? Do I acknowledge Bertinet or Bacheldre? Is it a combination of those two plus my newly acquired deeper knowledge of bread-making techniques? I have no answer for you. I simply rejoice in the fact that I achieved the required length in moments, rather than taking many minutes of sweating and cursing. I am not saying that my shapes are perfect, but that I am personally very happy with what I achieved. Only I know what has gone before. As I write this, I have three baguettes proving on top of the Rayburn and the oven is cranked up to 250°C. The kettle is boiling – I’ll add some water to a roasting pan as I can’t mist with cold water. Formed into balls and then rested again – this was the point at which I remembered that I needed to keep 200g back, so I retrieved it and bagged it in the ‘fridge. Forming the sticks was easy and fast, as already mentioned. I rested them in a tin, so that the table could be used for more important matters, such as eating. 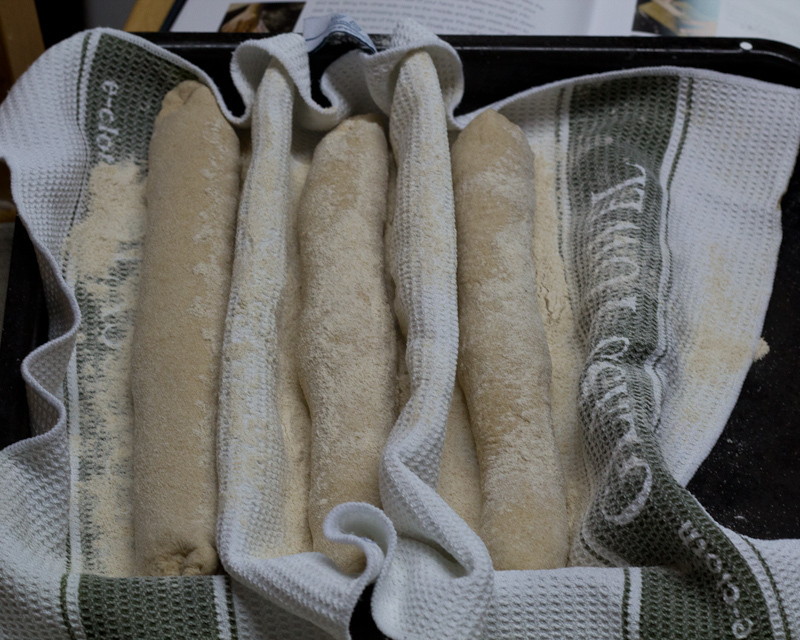 Moving the baguettes between cloth (in a roasting tin), “peel” (rimless baking sheet), and pre-heated baking sheet proved more difficult than Richard promised. 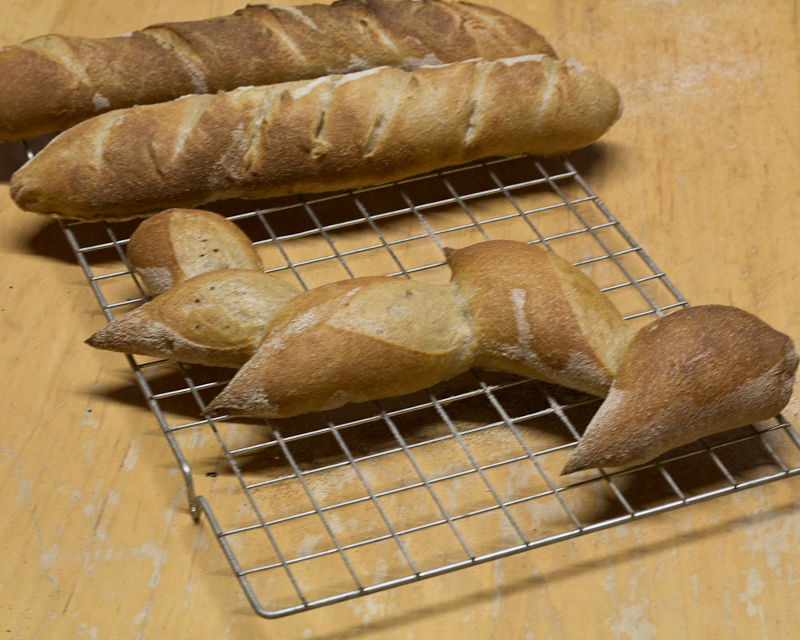 He said the dough would be strong and easily handled, but I managed to deflate two of my baguettes. They did bounce back in the oven, though. 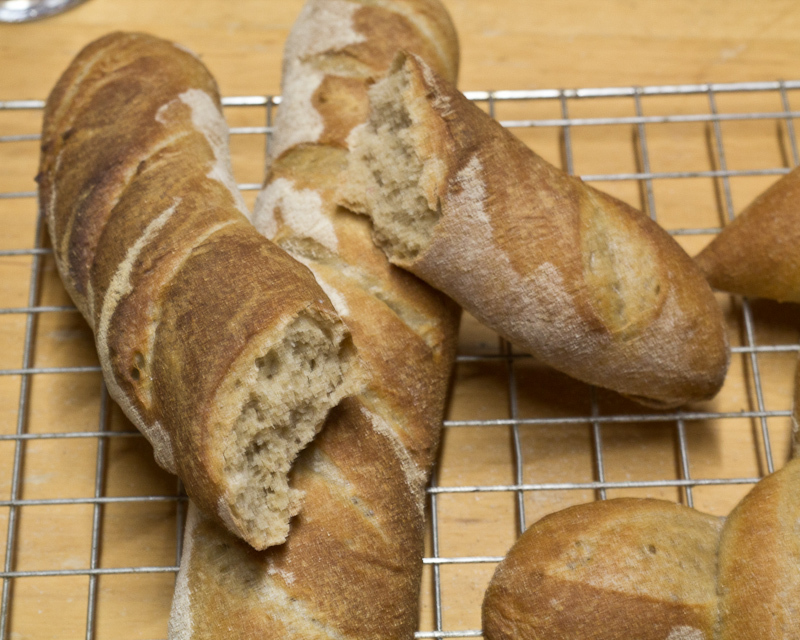 I have no photographs of the battered baguettes (nothing to be proud of!) 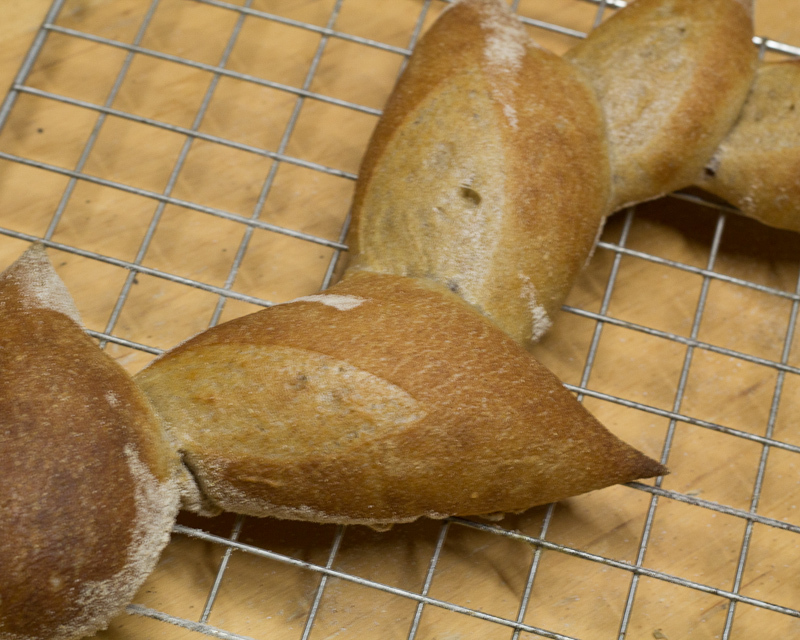 and very few beauty shots of the finished loaves. It was not for lack of trying there, I took many artfully arranged shots but camera shake took over and ruined most of the photographs. My, I love that epi. Such pretty bread! What a fantastic way to serve crusty rolls. There will be more epis is my life, I assure you of that. The unbleached flour makes a bread that looks like wholemeal, but it is not. It really is a light soft crumb, of white bread. This is white bread. No, really. Mr L is OK with the colour. He liked the bread. 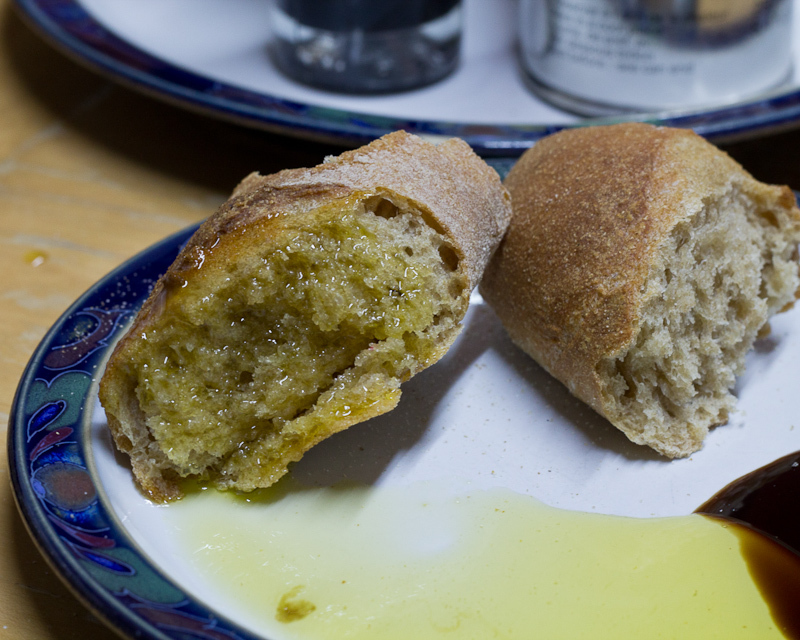 Especially when we tried it warm, with some olive oil and balsamic vinegar. Personally, I find this bread a little too salty – it was fine with olive oil but I would not care to put a standard UK salted butter on top. I may have to buy further unsalted butter supplies. We are having problems with a recalcitrant central heating boiler so will spend the rest our our evening in front of the fire, with the Inkspots – Mr L has a new 50 track album.